Growing a salad is one of the best ways to save on groceries. 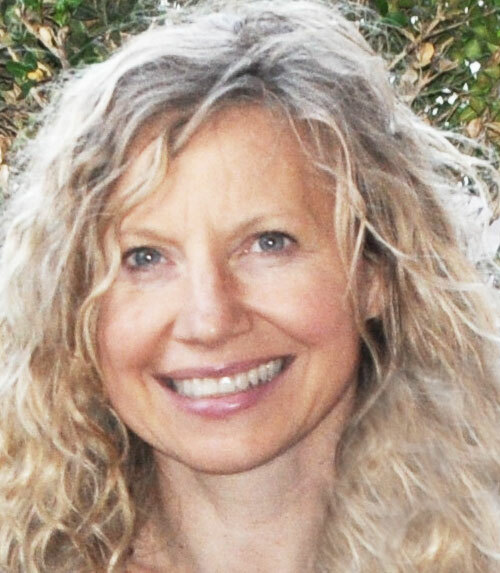 How many times do you buy lettuce at the store, intending to make a salad, only to find the greens soggy and wet before you get around to making the salad? Or, even if you do make that salad, you still have way too many greens than you need — and they are tossed. Waste of money! Growing your greens takes up much less space than you realize, and many of the plants here are actual “flowers” and vines than can be planted in flower pots and flower borders, or can be incorporated into flower pots. Your virtual salad bar gives you the benefit of fresh greens that you can snip exactly when you want them. Plus, considering that greens love cold weather, they are one of the earliest, and latest vegetables you can grow… they will keep your plate full throughout a long growing season. Lettuce, the traditional green, however, does not like heat. So, you’ll need to find some alternatives that will keep your salad bar intriguing, flavorful and thriving. 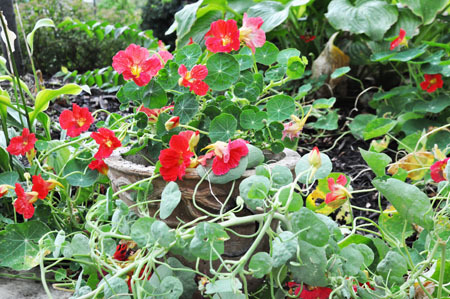 Nasturtiums: The leaves and flowers are completely edible, and have a slightly peppery taste similar to arugula. (Here’s the recipe for nasturtium pesto.) But nasturtiums are much easier to grow than Arugula. Pick up seed packets at your grocery store, soak the seeds in water overnight, and plant in flower pots or flower beds. They are beautiful. Sprinkle seeds with a bit of cayenne pepper… squirrels will dig up your seeds and eat them after you’ve planted them. Pea Shoots: Before the pea pods are formed on your peas, snip off some leaves… these leaves have a soft texture, and an almost “creamy” fresh taste. 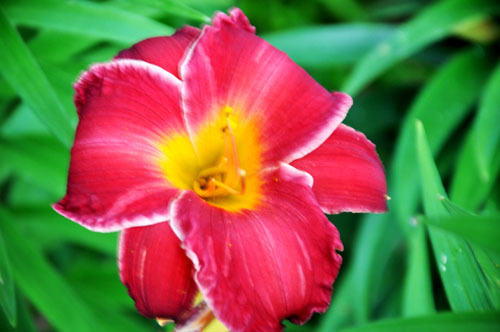 Flowers: Violets, zucchini blossoms, daylilies and bachelor buttons are just a few of the edible flowers. Yes… they are edible. Even the Tiger Lilly. You can fry flowers too. Here’s the recipe. 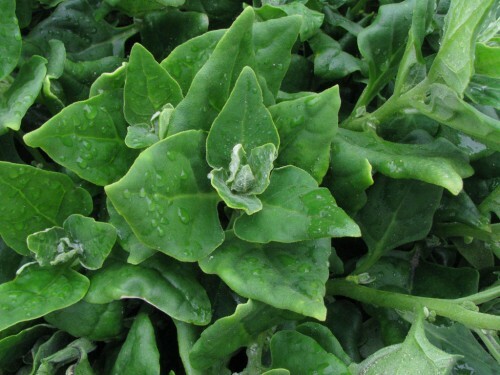 Traditional spinach that you find in the produce section) does not like heat. New Zealand is beautiful….like a sweet potato vine, and grows prolifically, and gets beautiful white petunia-looking flowers. The taste is very, very yummy. This is a must have for flower pots. Herbs: Goes without saying that when your mint, sage and chives start to overgrow, they can be cut up and thrown into salads. Or better yet, toss them onto an olive-oil coated hot skillet with some day old bread and make croutons. 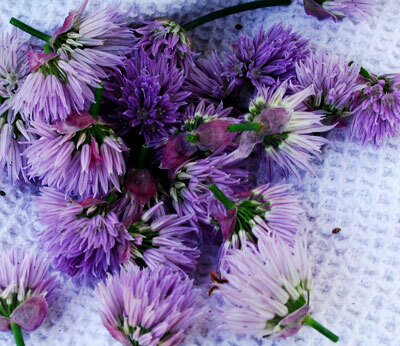 Make Chive-blossom vinegar for your salad… recipe here. Green leaves on growing vegetables: You may be growing carrots, radishes, broccoli and beets, but until those veggies show up, you can take a bit of the leaves off to throw in your salads. Don’t take them all, of course, but just enough to fill out your salad to make it more interesting. Greens: If you aren’t using pesticides, dandelion greens, I’m sure, are growing somewhere in your yard. Delicious fried in bacon grease!